Department of Accounting, Faculty of Business, Widya Mandala Catholic University Surabaya, Indonesia. Research aims: This study experimentally examines the relationship between relative performance information (RPI), goal setting and performance. Hypotheses are developed based on social comparison theory, goal setting theory and relevant prior studies. Design/Methodology/Approach: This study deploys multiple sessions of experiments with 110 undergraduate students as the participants. The two manipulated variables are the provision of RPI and the level of goal difficulty. Research findings: Results from the experiment indicate that the presence of RPI is positively associated with performance, and an attainable goal is associated with high goal commitment and eventually, higher performance. More importantly, this study finds an interaction between RPI and goal commitment, where the positive effect of RPI on performance is more pronounced in a condition where individual’s goal commitment is high. 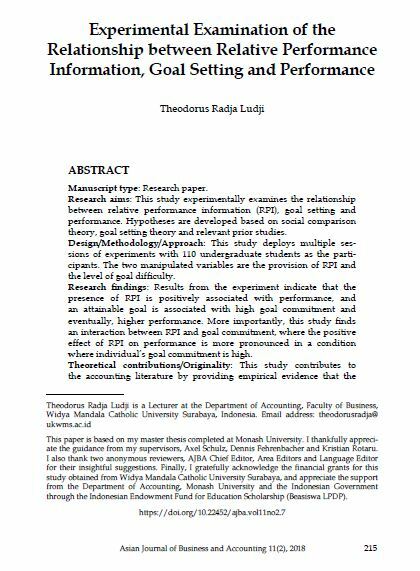 Theoretical contributions/Originality: This study contributes to the accounting literature by providing empirical evidence that the positive effect of RPI on performance can be enhanced to a greater degree by individual’s high commitment towards the assigned goal. Practitioner/Policy implications: This study has a practical implication by providing empirical evidence on how RPI and goal setting can be used strategically by firms to escalate employee’s performance. Research limitations/Implications: Limitations related to the types of RPI, goal levels and experiment task applied. Future studies may address these limitations and use a different type of task that is more closely associated with the current workplace situation.